Provided to EDmarket members by the School Market Research Institute (SMRI), can help you get your fair share of the market and grow your business. It is the single, easy-to-use, convenient resource that is exclusively devoted to all aspects of marketing to educators. Each month all 12 pages are filled with specific and proven ways to increase sales and deliver improved profits. 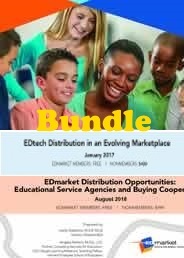 A $119/yr value, FREE for EDmarket members!